Welcome to The One - luxurious city living in the heart of trendy Olympic Village. 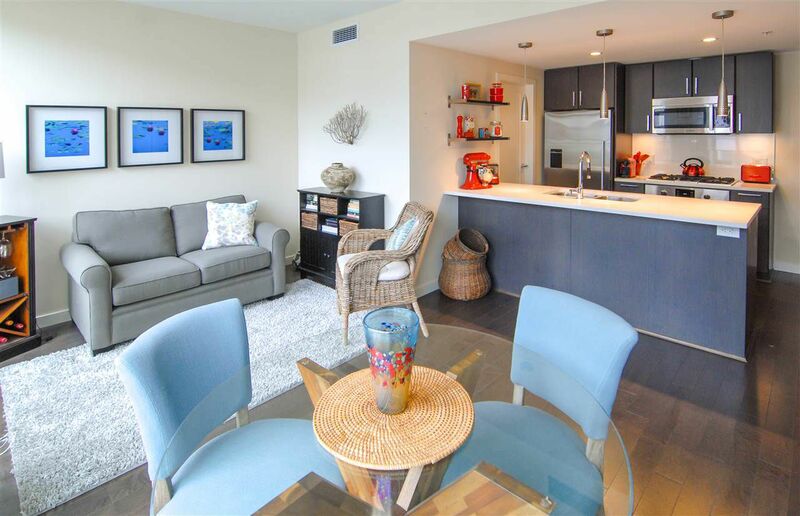 With quartz/granite counters & engineered hardwood floors, this one bed/bath condo boasts high end finishes throughout. A wide layout means floor to ceiling windows in in the living/dining room and bedroom. The flex space is perfect for a small office or walk-in pantry. Additional features include A/C, full size washer/dryer, gas range, Bosch/Fischer appliances. The large 125ft patio is ideal for entertaining. Superb amenities - gym, party room, lounge and bike room. Enjoy city views while soaking in the rooftop hot tub or infinity pool.The suite includes one parking stall, storage locker. Strata fees incl. hot water and gas. Pets/Rentals permitted. OPEN HOUSE: May 6, 1-3pm, May 7, 2-4pm.